Under 2,500 CFS- Low, and the most common level from July through April, though things rarely get lower than 1,200 cfs. You can get some surfing in but it’s not as high performance as with higher water. 2,500-5,000 CFS- Low/Medium. Things are shaping up a little better and the boat chute surfs better. The main feature is wider, more powerful, and holds a better shape. Eddy service is still pretty good. Water starts spilling over two concrete blocks in center-right around 3,500 cfs. 3,500 is also prime for the south canyon wave, which is about 3 miles downstream if you want to escape the crowds. 5,000-10,000 CFS- Medium/high. The boat chute wave continues to widen and starts to surf really well. The main feature also starts to wave out as things get higher. Eddy access is possible until 6,000 or so, but after that you’re hiking back up. 10,000- 15,000 CFS- High. This is in the range of most years’ peak flows, and the park is really kicking at this point. One of the best big river surf waves in the country. Hikes can get significant if you don’t get to shore quickly. 15,000-20,000 CFS- Very High. Things are getting more and more dynamic at these flows. The wave greens out some around 15,000 cfs, but as it gets closer to 18,000 cfs the wave starts to break more consistently. Over 20,000 CFS- Huge. Doesn’t happen very often. Watch out for debris (think trees, not just logs) coming through the park – a spotter isn’t a bad idea. Colorado River below Glenwood is pretty accurate for this stretch. For the most part bigger is better, but you’ll find something here at most flows that you can surf. You can also find a webcam here to check out the wave. 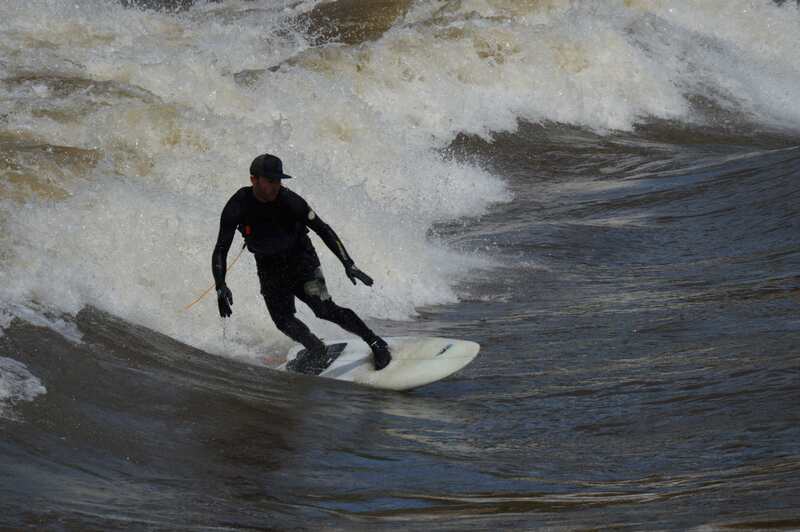 For photos of the waves at specific flows, check out the River Surf Report. Want flow alerts for this gauge? Sign up here. The Park is still under construction and parking is very limited. No parking is allowed on Midland Avenue! You may be ticketed! Please do not park in a manner that impedes traffic. Overnight camping is not permitted in the immediate area. Please contact Glenwood Canyon Kayak ¼ mile up Midland Avenue (first left) for information about camping or parking – (970-928-9949). Additional camping information is available from the US Forest Service (970-945-2521) or BLM (970-947-2800) Monday-Friday. Helmets and Personal Flotation Devices are required at all times.